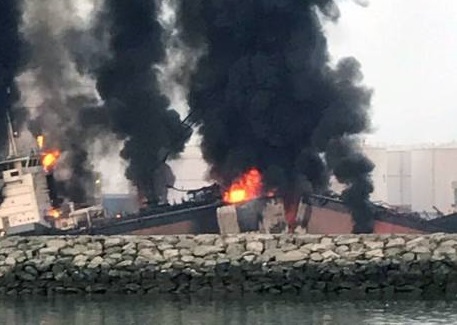 The product tanker Ebrahim 1 caught fire after explosion at Al Hamriyah Port in Sharjah, UAE. The accident occurred during offloading of petroleum products and diesel oil, causing death of one crew and serious injury to four workers. The massive explosion on board of the vessel caused serious damages to the tanker Ebrahim 1 breaking into two, which was followed by large fire. During the accident on board there were 21 crew and workers. 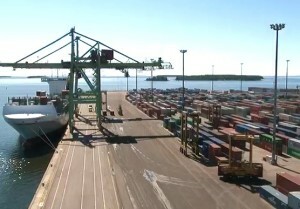 The fire was reported to local authorities and at the scene arrived firefighters, who succeeded to control the blaze the restricted spreading to the nearby vessels at the port. There was minor oil spill from the troubled tanker, but it was restricted from spreading and the leaks were stopped by hazmat teams and firefighters. “The accident took place around 5.29am. 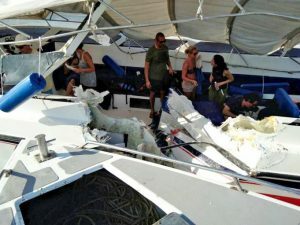 The captain and his crew members were present on the vessel at the time of the incident. A total of 16 sailors were evacuated safely. Fire crews were able to contain the fire and prevent it from expanding to the docks or to adjacent vessels and also controlled the oil from spilling over”, said the director of Sharjah Civil Defence, Lt Col Al Naqbi. “The injured workers were transferred to Khalifa Hospital in Ajman and Umm Al Quwain hospital and they are in a stable condition now. The sailors, including the deceased and the injured, are Indians and are aged between 22 and 30”, added he. Thick, black smoke was still seen billowing from the ship on Saturday afternoon. A Civil Defence team boarded the vessel and found the body of one person and four other sailors were seriously injured and transported to local hospital. Sixteen workers were evacuated safely. The cause of the fire which broke out early morning remained unknown. The investigation is under way. The product tanker Ebrahim 1 (IMO: 9019339) has overall length of 90.00 m, moulded beam of 15.60 m and maximum draft of 4.50 m. The deadweight of the ship is 5,071 DWT and the gross tonnage is 2,739 GRT. The tanker was built in 1991 by Singapore Technologies Shipbuilding.